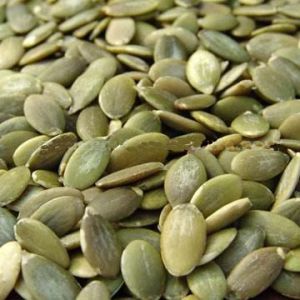 Pepita is a Spanish culinary term for the pumpkin seed, the edible seed of a pumpkin or other cultivar of squash. The seeds are typically rather flat and asymmetrically oval, and light green in color inside a white hull. The word can refer either to the hulled kernel or unhulled whole seed, and most commonly refers to the roasted end product. Raw nuts and seeds, including pumpkin seeds, are one of the best sources of plant-based omega-3s. We all need ALA, however, ALA has to be converted by your body into the far more essential omega-3 fats EPA and DHA by an enzyme in which the vast majority of us have impaired by high insulin levels. So, while pumpkin seeds are an excellent source of ALA.
Pumpkin seeds have long been valued as an important natural food for men’s health. This is in part because of their high zinc content, which is important for prostate health, and also because pumpkin seed extracts and oils may play a role in treating benign prostatic hyperplasia. Research suggests that both pumpkin seed oil and pumpkin seeds2 may be particularly beneficial in supporting prostate health. Pumpkin seeds are a rich source of tryptophan, an amino acid (protein building block) that your body converts into serotonin, which in turn is converted into melatonin, the “sleep hormone.” Eating pumpkin seeds a few hours before bed, along with a carbohydrate like a small piece of fruit, may be especially beneficial for providing your body the tryptophan needed for your melatonin and serotonin production to help promote a restful night’s sleep. great, very informative for me as chef, i kove it.